What Are The Health Benefits & Potential Side Effects Of Pine Nuts? Pine nuts, which are also called pinon nuts, pignoli nuts and Indian nuts, have been a tasty treat enjoyed as long as ancient times. These nuts were enjoyed by Roman soldiers and have been mentioned by many Greek authors since 300 BC. The nutritional contents of pine nuts are the same with others nuts, which includes antioxidants and healthy monounsaturated fats… but did you know that pine nuts are not nuts? Yes, they aren’t. Pine nuts are loved all over the world, and in the US alone the market for these nuts are grown to a $100 million (though 80% of pine nuts in the US are imported). You can eat raw or roasted pine nuts, with their crusty texture and sugary and nutty flavor, they’re great for snacks, many vegetable dishes, and sauces such as pesto. Pine nuts are harvested from the seed of pine trees. You can find them in the middle of the pine cones’ scales; however, though all pine trees produce pine nuts, only 20 kinds of pine nuts are big enough that can be worth eating. After it is harvested from the cones, these nuts must be shelled and should be eaten shortly after. Pine nuts that are unshelled are susceptible to spoiling because of its high oil content (just to be sure, it’s advisable to store them in a fridge). What are its Health Benefits? Pine nuts are rich in calorie. About 100 grams of dry kernels can provide 673 of calories. 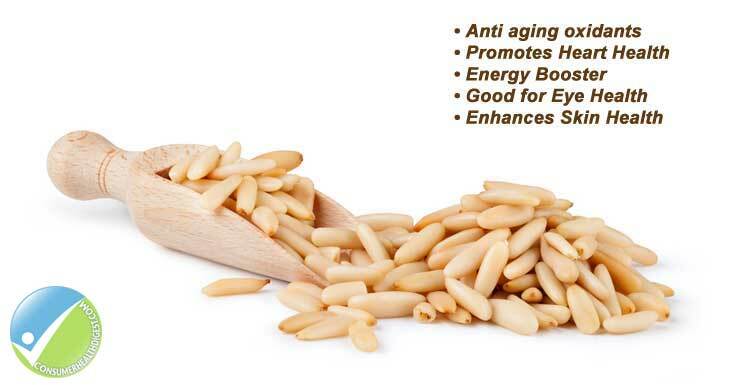 Also, pine nuts are great sources of antioxidants, minerals, vitamins and phytochemicals. Pine nuts also have lutein, which are carotenoid that aids in warding off eye illnesses such as AMD or age-related macular degeneration. Macula is a small part of the eye about 2 mm wide, found in the back portion of the eye, in the middle part of the retina. The high caloric content of pine nuts comes from fats. Pine nuts are rich in mono-unsaturated fats like oleic acid with a ratio of 18:1 undifferentiated fat, which aid in decreasing levels of LDL also known as “bad cholesterol” and at the same time escalating the levels of HDL or “good cholesterol”. According to research, Mediterranean diet, which are packed with antioxidants, monounsaturated fatty acids and vitamins aids in preventing coronary artery diseases and strokes by promoting healthy blood cholesterol levels. Pine nuts also are rich in essential fatty acid (omega-6) or pinolenic acid. According to recent studies, it can be potentially useful in losing weight by curbing appetite. Pinolenic acid activates the release of cholecystokinin and glucagon-like peptide-1in the gut, which are hunger-suppressant enzymes. And pinolenic acid is said to have LDL-lowering capabilities by improving the uptake of hepatic LDL. Same with almonds, pine nuts are a great source of Vitamin E. Around 9.33 mg for every 100 grams (which is 62% of RDA). Vitamin E is a strong lipid soluble antioxidant, needed for keeping the cell membranes integrity of the skin and mucous membranes by defending it from bad oxygen-free radicals. Additionally, pine nuts are among the gluten-free nuts, so they are great ingredients for gluten-free formulas. These formula preparations are a good alternative for people who are allergic to wheat and have celiac disease. According to a study last 2009 published in the “Journal of Diabetes Science and Technology”, after ingestion, pine nuts creates a feeling of fullness, which results in a decrease of food consumed. Pine nuts have the capability to rouse the neural pathways in the brain that activates appetite reduction and satiation. Pines are also a great source of Vitamin B Complex like folate, pantothenic acid, pyridoxine or vitamin B-6, niacin, thiamin, and riboflavin. B-complex vitamins act as co-factors for enzymes for metabolism of the cellular substrate in the human body. Also, pine nuts have healthy quantities of essential minerals such as calcium, potassium, iron, manganese, magnesium, selenium and zinc. About 8.802 mg for every 100 grams (around 383% of RDA), pine nuts are among the richest sources of manganese. Manganese is also a vital co-factor superoxide dismutase, which is an antioxidant enzyme. Thus, eating pine nuts aids the body in developing resistance from infectious Agents and Effects of Harmful Oxygen-Free Radicals. What are The Potential Side Effects? People who are allergic to peanuts and other types of nuts may have an allergic reaction to pine nuts. According the Alergologia e Inmunologia Clinica at the University of Navarra in Spain, they were able to find the commonality among people with allergies to pine nuts and peanuts. Some individuals report that after eating pine nuts, they experience a bitter aftertaste. This symptom normally goes away in just a few minutes, but may also last for a few hours. You can consume pine nuts raw or roasted. A full shot glass of pines is sufficient to fill you with nutrients, to keep away hunger and to prevent waistline growth. A lot of people consume whole pine nuts. You can also buy pine nut oil in the market. You can drink and apply it to the skin as a form of skin supplement. Indeed, pine nuts can provide us with a lot of healthy benefits if consumed in moderation. You can buy pine nuts at supermarkets and health food shops, and are convenient to carry as a snack to chew on through the day. You can also buy it in the form of oil, which also delivers various benefits. Non-commercial use OK, cite ConsumerHealthDigest.com with clickable link. Note: Consumer Health Digest isn't a healthcare provider. We can't respond to health questions or give you medical advice. This article was informative. I have a medical question. This article doesn’t have the information I’m looking for. I have a medical question.